K'JIPUKTUK, HALIFAX - It started with a couple of anonymous phone calls to the Ecology Action Centre reception desk, sometime last fall. 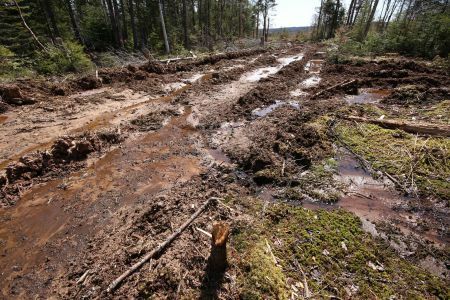 "The calls were from people working in the forestry sector, telling us to go up to Big Marsh, north of Antigonish," Matt Miller, Forestry Coordinator at the Ecology Action Centre (EAC), tells the Halifax Media Co-op. Miller and his EAC colleague Raymond Plourde, Wilderness Coordinator, decided to take a look. "What we found there was a new low in forestry harvesting in Nova Scotia. Trees in parts of a stand that they were working in were barely 30 years old," says Miller. Responsible for that particular cut is the US-based multinational Wagner Forest Management Ltd. It has a contract with Nova Scotia Power Inc. to supply the biomass power generator in Point Tupper, Cape Breton. 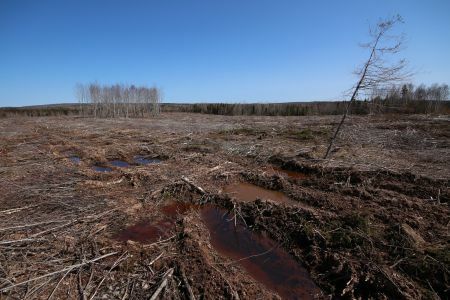 Many environmentalists believe that the voracious appetite of that biomass plant is stressing forests in eastern Nova Scotia and jeopardizing the future of much of the forest industry. When Nova Scotia Power Inc. (NSPI) bought the NewPage biomass power plant at Point Tupper in Cape Breton for $80 million in 2010 it was presented as a win-win. The wood-fired turbine would help Nova Scotia meet its renewable energy targets, and the sale provided a struggling pulp and paper company with some much-needed cash. The 60 megawatts facility will account for up to 12% of renewable energy requirements by 2015. This will take a lot of biomass, in the form of low-value softwood, bark and similar waste. 650,000 tonnes per year, or some 50 truck loads each and every day. Even before the plant was operational environmentalist were worried that there would not be enough fuel to meet demands. Recent newspaper reports suggest they may be right. Hardwood sawmill operators have been complaining that high quality wood that should be set aside is instead being burned to generate electricity. Doing so would contravene forest biomass procurement rules set by the government. As well, Cape Breton firewood suppliers are raising the alarm about a lack of supply. They also point at the biomass plant's appetite to explain why firewood is hard to get and prices are going up. "There seems to have been a tremedous upswing in the amount of harvesting that is taking place in hardwood stands in eastern Nova Scotia to feed this boiler," says Miller. "As a result there should be an increase of fiber flow to these hardwood mills. That's not happening, and based on that alone I would conclude that logs are being chipped," Miller argues. Brian Peters is co-chair of the Margaree Environmental Association. His organization recently called for the provincial government to put biomass harvesting on hold. "We called for a comprehensive review, we need to make sure not only that regulations are appropriate and adequate, but also that they are being adhered to, and enforced when they are not," Peters tells the Halifax Media Co-op. Partly the concerns are ecological in nature. Environmentalists ask how much harvesting the forests can sustain, especially given that there are so few limitations on clearcutting on private lands. "All along we were concerned about the ability of the forest to support the pulp mill, and the problem will only be exacerbated by the biomass plant. Demand essentially doubles," says Peters. "The fall out is not only that existing businesses become vulnerable [because of a lack of high quality wood], but it also jeopardizes the potential to diversify our forests industry, focusing more on higher-value end products," says Peters. "Unfortunately our focus on pulp and paper and biomass means we are dumbing down the forest and putting all our eggs in a very low-value basket," he says. Nova Scotia Power counters that it only uses sustainably harvested waste woods and that it audits its biomass suppliers. It also announced that it has hired additional staff to ensure compliance. Both Peters and Miller believe that part of the problem is that Nova Scotia Power does not pay a fair price for the biomass fibre. "Contractors are being paid very low amounts of money for this wood," says Peters. "In order to pay of their equipment contractors are forced to cut corners, environmental standards suffer, and large areas are being clearcut because alternatives are not viable." For now government doesn't think that there is cause for alarm. 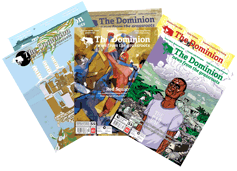 Bruce Nunn, spokesperson for the Department of Natural Resources, writes in an email to the Halifax Media Co-op that "forest harvesting is not so precise to prevent a small percentage of sawlogs from entering the biomass fuel system along with lesser quality fibre --- but we have not seen evidence that that is happening in any large amounts." The email did not address our question pertaining to overall ecological sustainability of the biomass plant's supply source. When is a clear cut not a clear cut?